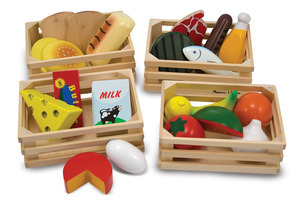 Melissa and Doug have a lot of great play food and accessory options and are some of the cutest sets on the market. 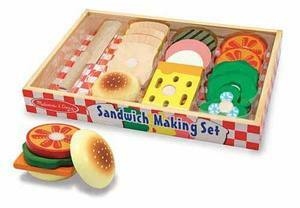 Below are some that you might consider adding to the play kitchens we discussed yesterday. 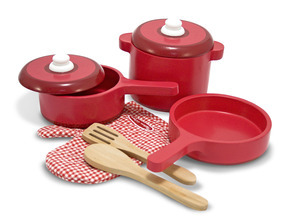 This 8 piece set includes a fry pan, a sauce pan and stock pot with lids, a wooden slotted spatula and wooden spoon, and an oven mitt. Hannah is ALL about wearing oven mitts when we're cooking, and I like that the set is made of wood. The red color might clash with some pink kitchen sets, but that might not be a big deal to you. are all featured in this 21 piece set. 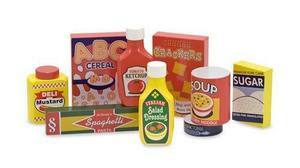 WOOD - This 9-piece wooden set of dry goods includes tuna, ketchup, spaghetti, soup, sugar, crackers, salad dressing, mustard and cereal. 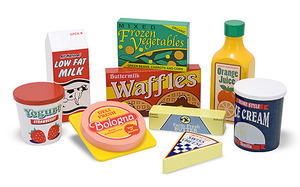 WOOD - This 8-piece wooden set include orange juice, waffles, milk, ice cream, cheese, yogurt, frozen vegetables and butter. 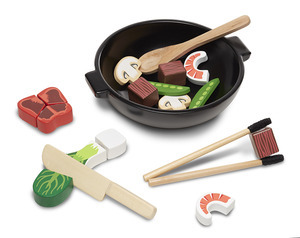 WOOD - This 16-piece set includes all the fixin's you'd need to make a sandwich and velcro to hold the pieces together. 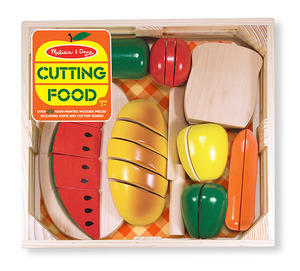 WOOD - These sets feature Velcro-like closures that provide a nice 'crunch' sound when they're sliced. 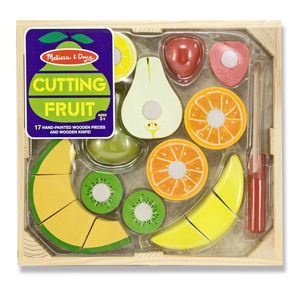 These sets are a great way to introduce your child to fractions - the loaf is cut in fifths, the cantaloupe is cut in fourths, the tomato in thirds, the pear in half, etc. 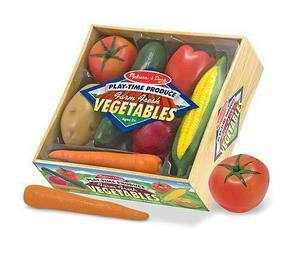 These are molded plastic and might have some questionable contents if your child mouths the toys. 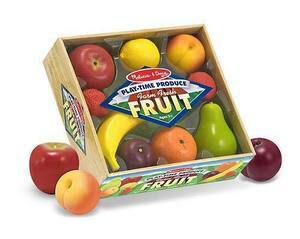 The package is clearly marked 3+, so if your child is younger, you might look into a wooden alternative. Although this set includes a wooden spoon, knife and a large bowl which would be great additions to your kitchen, this set isn't food heavy. However, if your family prepares stir fries often, your child might like to mimic that. this set would be a great addition to your playroom. Pickled ginger and wasabi! Swoon. I never realized how many dessert sets M&D carried. For the sake of brevity (which is laughable considering how long this post already is) I'm only going to feature three sets that I might consider buying Hannah. 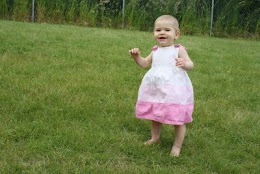 and 'Clean Up!' as we put all the pieces back in the container. 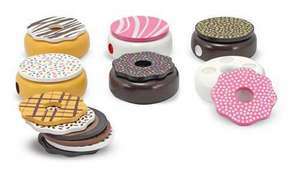 Six doughnuts and 12 toppings are included in this set. I would prefer in the toppings could be used in matching games, but it appears that each topping is different. 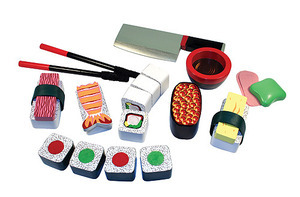 However, there are not a many small pieces, so this might be a good set for younger children. For these reasons, I'd rather buy the brownie or cookie sets. 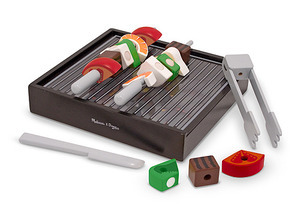 Alternatively, I think the brownie set could be used in numerous ways. 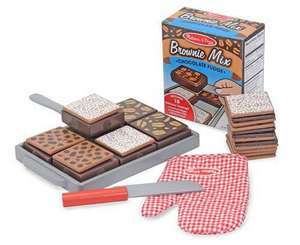 Six brownies and 18 toppings (six each of three patterns) are included, as well as a tray, box to contain the pieces, spatula, knife, and oven mitt. This set appears to be a great deal. 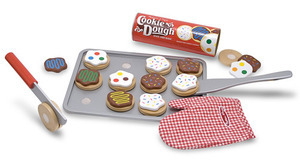 12 cookies, 12 toppings, cookie sheet, spatula, knife, and oven mitt. 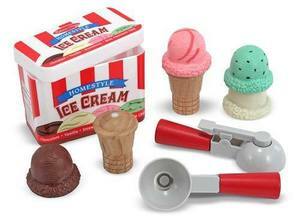 Similar to the brownie set in it's usefulness and value. 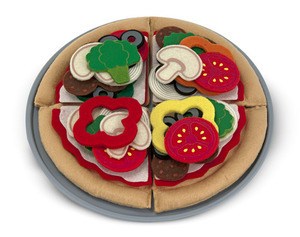 I'm a sucker for felt food. It's cute, soft, relatively chemical free, and - perhaps most importantly - it doesn't hurt to step on when your child misses a piece during clean up. I love that it includes white and wheat bread, a pita pocket and a sub sandwich roll. 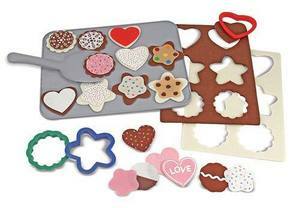 Perfect for a pretend version of Christmas sugar cookies. 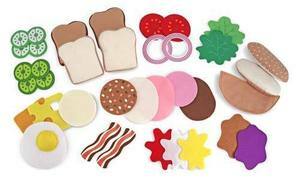 With 42 pieces, this set might be a little much for your child to keep track of, but it would be a great set for fractions, and 'same vs different' exercises. 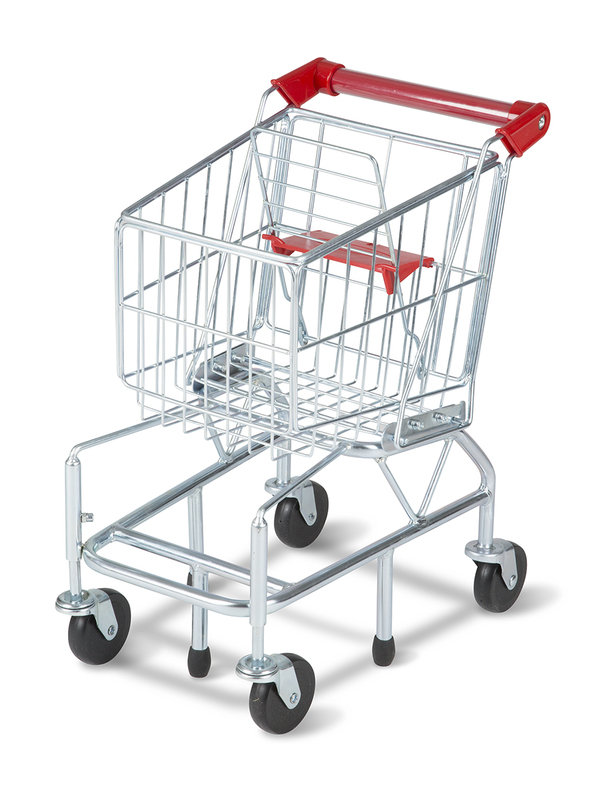 Dokazano je, da razumljiva vsebina, med pregledovanjem oblikovne rešitve določene strani, neželeno preusmeri pozornost bralca. Essie Can Be Fashionable Too!